East Midlands Trains has moved to reassure local authorities a new £17m station will not be a white elephant. 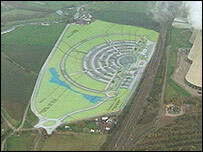 Construction of the Parkway station, near junction 24 of the M1 and East Midlands Airport, began in December. But a draft timetable raised concerns it would be served by as few as two trains an hour, threatening the viability of connecting bus services. Now East Midlands Trains has said it will get four trains an hour at peak times, with more improvements in 2009. Parkway has been on the drawing board for 10 years. Leicestershire County Council's Deputy Leader, Nicholas Rushton, said just two trains an hour could make the station almost redundant. "It is key to the airport to get the people coming in and out by other means than car. "But the airport is saying that at the moment they subsidise bus routes to Loughborough and Derby and they are concerned sufficient people will not use the Parkway because the infrequency of stops there. "So at the moment they are unwilling to subsidise a park-and-ride scheme from the station, so you could have an open station and no one using it." David Horne, commercial director of East Midlands Trains, insisted the station would start with a good service which would then improve. He said: "What we are hoping to do after 2009 is improve the spread of services in the off-peak period. "The infrastructure around the station is a bit limited; we can't use two lines which are reserved for freight. "When Network Rail do their resignalling work at the end of 2009 those freight lines will be available for passenger services, so we will be able to change the services."